"A Labor of Love", unique drawing by Olva Stewart Pharo, dedicated to the volunteers of S.I.R.E. and all therapeutic riding volunteer everywhere. 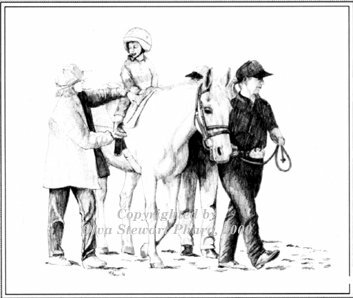 "A Labor of Love", by Olva Stewart Pharo, as seen on the cover of The Chronicle of the Horse, November 7, 1997. "A Labor of Love", a pencil drawing by Olva Stewart Pharo, is dedicated to all of the tireless volunteers who make S.I.R.E. Therapeutic Riding Program possible. The original work was donated to the S.I.R.E. benefit called "Horses and Harleys" a barbeque, auction and dance held at Tin Hall in Cypress, Texas in May, 1996. A limited number of signed and numbered prints are available for sale for $30.00 each. (Actual size 11" x 17". ) $10.00 from each print sold will be donated to S.I.R.E. to help them continue their valuable work. Also available in note cards. 10 cardsand matching envelopes per package at $10.95 each. $2.00 for each sale goes to S.I.R.E. Send $8.95 (+ $.65 Texas sales tax) plus $2.95 shipping per package of notes. You can have a print of this inspiring picutre to enjoy and at the same time help support the work of S.I.R.E. by sending $35.00 plus shipping and sales tax (Texas residents only), with our ORDER FORM, in check or money order to: Olva Stewart Pharo, P. O. Box 625, Dept. W, Cypress, TX 77410. Now accepting MasterCard, VISA and American Express. See ORDER FORM to place your order by fax to: 281-373-9304. For a FREE brochure on other equestrian prints or information on unique equestrian portriats send to the same address or e-mail to: portraits@texhorseman.com. For more information about S.I.R.E.